Vaccines have played an integral role to improving the health of a population by fighting off serious infections, like measles, or offering new approaches to prevent diseases, like cervical cancer. 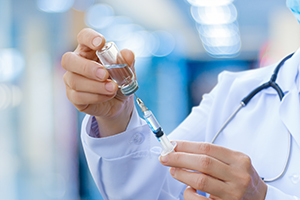 Vaccines work by stimulating the body’s natural immune system. Researchers at the University of Utah Health have developed a new method in crafting a vaccine to improve its efficacy. The vaccine cocktail delivers the immune-stimulating compounds to the lymph nodes, small, bean-shaped glands found throughout the body. The lymph nodes act like launch pads in the lymphatic system that ignite the body’s immune response to fight pathogens or cancer cells. The lymphatic system is an integral part of the immune system, and the lymph nodes provide the ports where vaccine can be ferried throughout the body. In this study, the researchers developed a new preparation to ensure the vaccine cocktail is transferred quickly to the lymph nodes and activates the immune system more efficiently. In particular, they focused on a vaccine concoction that could combat pathogens and cancers. They tested its effectiveness in mice. Vaccines are one way to kill disease pathogens,” said Peng Wang, lead author on the paper. “You don’t have to use a toxic drug . . . just trigger the immune system to do the job for you. The team developed a vaccine mixture that easily binds to albumin, the most common protein in blood and a typical carrier fluid in the lymphatic system. The vaccine accumulates in the lymph nodes before it is whisked away and distributed by the body’s lymphatic super-highway of the body to other tissues. In addition, the albumin-bound vaccine promotes antigen presentation, which can lead to greater vaccine potency. The team applied this approach for an albumin-binding melanoma vaccine. The vaccine can increase the anti-melanoma immune response in the lymph nodes. This outcome is important, because cancerous cells can move to other organ systems using the lymphatic system. By employing the lymphatic system, the researchers enhanced anti-tumor immune responses, opening a new way to halt the spread of cancer.